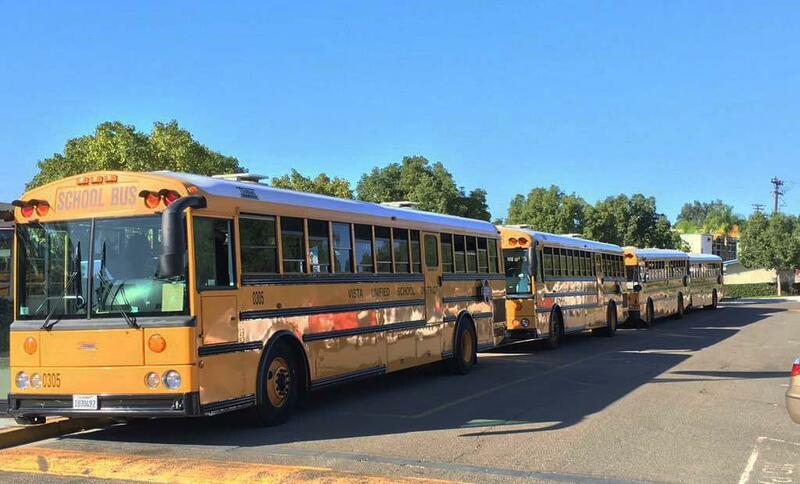 HOUSTON (July 24, 2018) – Vista Unified School District (VUSD), a public school district based in San Diego County, California, has switched its fleet of 53 school buses to run on Neste MY Renewable Diesel™. VUSD is the 4th largest school district in San Diego County and is comprised of 32 schools with diverse educational programs that range from kindergarten schools through adult education facilities. VUSD serves more than 23,000 primary to high school students and 2,000 adult education students in Vista, as well as sections of Oceanside, San Marcos, Carlsbad and some unincorporated areas of the San Diego County. According to Bill Weisberg, director of transportation for VUSD, Neste MY Renewable Diesel offered improvements for his fleet in several respects. “When considering our students’ health and safety, the local air quality, and the reduction in preventative maintenance costs, this was clearly a win-win solution for our district,” Weisberg said. Weisberg singled out the clean-burning properties of Neste MY Renewable Diesel as a way to cut back significantly on the fleet’s maintenance costs. “We should see less residue in our fuel filters and in the Diesel Particulate Filters (DPFs). These filters constantly need attention when using standard CARB (petroleum) diesel. This will save our mechanics time and keep our buses on the road,” he said. Neste MY Renewable Diesel is a low-carbon fuel produced from 100% renewable and sustainable raw materials, primarily wastes and residues. This premium diesel cuts greenhouse gas emissions by up to 80%, reduces carbon monoxide by 24% and fine particulates by 33%, all while enhancing fleet performance. Unlike biodiesel, Neste MY Renewable Diesel is a direct replacement fuel that requires no blending and is compatible with all diesel engines. Petroleum diesel and biodiesel contain aromatics and impurities that can contaminate oil, foul fuel injectors and clog the DPF filters. Renewable diesel contains nearly zero impurities and burns much cleaner. This can have an instant positive effect on exhaust aftertreatment systems (less soot produced can mean fewer DPF regenerations) and fuel system components (lack of impurities reduces deposit formation in critical fuel injector parts). IPC USA, based in Santa Ana, California, is the exclusive distributor of Neste MY Renewable Diesel to VUSD. Using exclusive distributors ensures supply chain integrity and guarantees it’s high quality.